Be the first to share your favorite memory, photo or story of Osmon "Oz". This memorial page is dedicated for family, friends and future generations to celebrate the life of their loved one. Rev. Osmon (Oz) Wallace Adams went home to be with our Lord March 28, 2019. He had battled respiratory disease for the last several years with grace and dignity. His beautiful smile and positive disposition was a continual blessing to all who came in contact with him. He was a dearly loved son, husband, father, grandfather and friend. He gave his heart to Jesus Christ and his life to knowing Him and making Him known. He had a humble, servant's heart and lived to love and give to others. Georgia area. He served his country as a member of the United States Army from 1963-1965 and as a City of Atlanta Police Officer from 1961-1986. He was ordained as a minister of the Gospel of Jesus Christ in 1985. 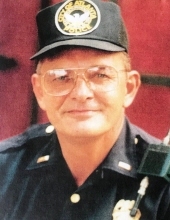 Following his retirement from the City of Atlanta Police Department with the rank of Lieutenant, Oz remained an active public servant in various outreach ministries, a church start and directing security provisions for U.S. Federal and various private properties in Atlanta. Following retirement from these endeavors, Oz and his wife retired to their peaceful, country home in Heflin, Alabama. He was preceded in death by his mother Montez Sessions Crowder and his father Osmon Adams, and his beloved wife Marianna Adams. He leaves behind his daughter Carmen Hollingsworth, son-in-law David Hollingsworth and grandsons Grant and Ross Hollingsworth of Peachtree City, GA.
A Celebration of Life service will be held Sunday, April 14, 2019 at 2:00 pm, at Pine Grove Baptist Church located in Heflin, Alabama. Details can be found on the website for Dryden Funeral Home, Heflin, Alabama. Research Hospital. These are the two organizations that he supported regularly. Oz leaves behind a legacy of faith, love and hope as he is more alive today than he has ever been! To send flowers or a remembrance gift to the family of Osmon "Oz" Wallace Adams, please visit our Tribute Store. "Email Address" would like to share the life celebration of Osmon "Oz" Wallace Adams. Click on the "link" to go to share a favorite memory or leave a condolence message for the family.